When you finally do turn on your Macintosh running OS X El Capitan, you set in motion a sophisticated and complex series of events that culminates in the loading of OS X and the appearance of the OS X Desktop. After a small bit of whirring, buzzing, and flashing (meaning that the OS is loading), OS X first tests all your hardware — slots, ports, disks, random access memory (RAM), and so on. 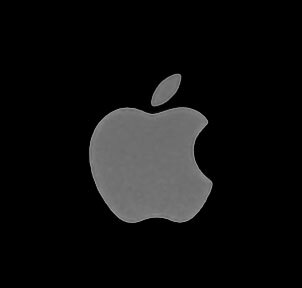 If everything passes, you hear a pleasing musical tone and see the tasteful whitish Apple logo in the middle of your screen, as shown here. This is what you’ll see if everything is fine and dandy when you turn on your Mac. Fine and dandy: Next, you might or might not see the OS X login screen, where you enter your name and password. If you do, press Return after you type your name and password, of course, and away you go. The Desktop soon materializes before your eyes. If you haven’t customized, configured, or tinkered with your Desktop, it should look pretty much like the one shown. Now is a good time to take a moment for positive thoughts about the person who convinced you that you wanted a Mac. That person was right! The OS X El Capitan Desktop after a brand-spanking-new installation of OS X.
Blue/black/gray screen of death: If any of your hardware fails when it’s tested, you may see a blue, black, or gray screen. Some older Macs played the sound of a horrible car wreck instead of the chimes, complete with crying tires and busting glass. It was exceptionally unnerving, which might be why Apple doesn’t use it anymore. The fact that something went wrong is no reflection on your prowess as a Macintosh user. Something is broken, and your Mac may need repairs. If your computer is under warranty, set up a Genius Bar appointment at your nearest Apple Store or dial 1-800-SOS-APPL, and a customer service person can tell you what to do. Prohibitory sign (formerly known as the “flashing question mark on a disk”): Most users eventually encounter the prohibitory sign shown here (which replaced the flashing question-mark-on-a-disk icon and flashing folder icon back in OS X Jaguar). This icon means that your Mac can’t find a startup disk, hard drive, network server, or DVD-ROM containing a valid Macintosh operating system. 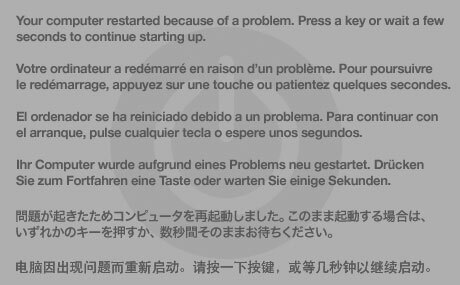 Kernel panic: You shouldn’t see this very often, but you may occasionally see a block of text in six languages, including English, as shown here. This means that your Mac has experienced a kernel panic, the most severe type of system crash. If this is what you’re seeing, things are definitely not fine and dandy. Choose About This Mac from the Apple menu (the menu with the Apple symbol in the top-left corner of the menu bar). A window pops up on your screen, as shown here. The version you’re running appears just below OS X El Capitan near the top of the window. 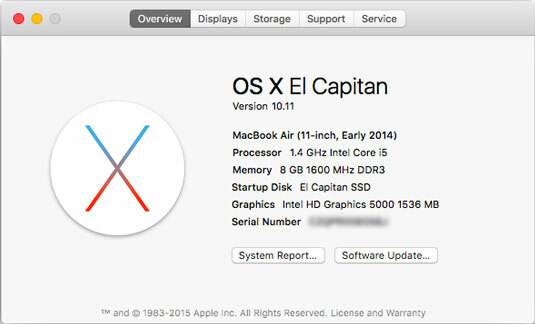 Version 10.11 is the release known as El Capitan. See which version of OS X you’re running. 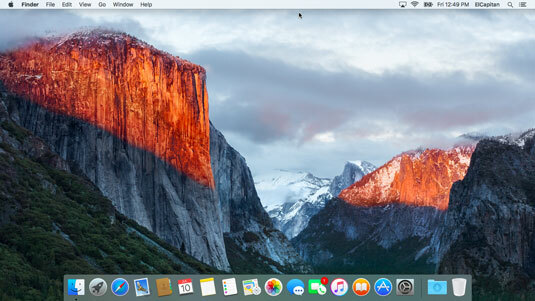 If you’re curious or just want to impress your friends, OS X version 10.10 was known as Yosemite; 10.9 was known as Mavericks; 10.8 as Mountain Lion; 10.7 as Lion; 10.6 as Snow Leopard; 10.5 as Leopard; 10.4 as Tiger; 10.3 as Panther; 10.2 as Jaguar; 10.1 as Puma; and 10.0 as Cheetah. (Optional) Click the Overview, Displays, Storage, Support, or Service tabs to see additional information about your Mac and the version of OS X that it’s running. Click the System Report button to launch the System Information application and see even more details. The System Information app shows you even more about your Mac including bus speed, number of processors, caches, installed memory, networking, storage devices, and much more.